These bite-sized snacks are soft and moist and stay that way even when cooled. They are the perfect size for school lunch boxes and quick snacks. 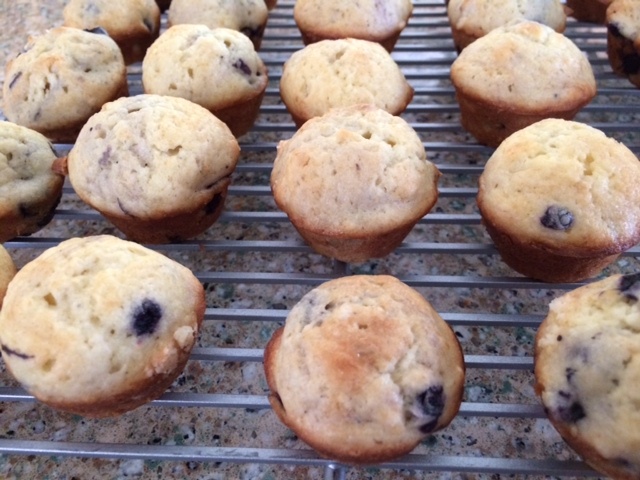 Mini muffins freeze and defrost well so go ahead make a whole bunch at one time. Be sure to let the kids help gather ingredients, measure, mix, and pour the batter for these yummy snacks. 1. Preheat oven to 375 deg. F. Spray mini muffin tin with vegetable spray so they don’t stick. 2. Whisk dry ingredients and mix-ins in one bowl and set aside. 3. Whisk wet ingredients in another bowl. 4. Add milk mixture to flour mixture and use a spatula to very gently fold mixtures together, about 5 or 6 strokes only. There will be lumps; do not over-mix. 5. Spoon batter into greased mini muffin tin and bake at 375 deg. F. for 10-12 minutes, or until tops are golden brown.